PITTSBURGH – Continuing its mission to provide military veterans and their spouses with the finest choices for post-secondary education, VIQTORY has released the 2019-2020 Military Friendly Schools list. West Georgia Technical College is ranked number three in the nation in the small community college category for its outstanding efforts to support veterans, military service members and military service family members who are enrolled at the college. 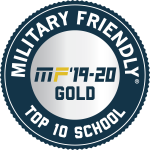 Institutions earning the Military Friendly® School designation were evaluated using both public data sources and responses from a proprietary survey completed by the school. For the first time, student survey data was taken into consideration for the designation. This year 766 schools across the nation received the “military friendly” designation. The Military Friendly® Schools survey is administered for free and is open to all post-secondary schools that wish to participate. Criteria for consideration can be found at www.militaryfriendly.com. West Georgia Technical College, with campuses in Carroll, Coweta, Douglas, Haralson and Troup counties and class sites in Heard and Meriwether counties, offers more than 120 associate degree, diploma and technical certificate programs of study. A unit of the Technical College System of Georgia, West Georgia Tech is one of the largest of the state’s 22 technical colleges. For more information, please visit westgatech.edu. Founded in 2001, VIQTORY is a service-disabled, veteran-owned small business (SDVOSB) that connects the military community to civilian employment, educational and entrepreneurial opportunities through its G.I. Jobs® and Military Friendly® brands. VIQTORY and its brands are not a part of or endorsed by the U.S. Dept. of Defense or any federal government entity. Learn more about VIQTORY at www.viqtory.com.